Let me share an interesting neglected and underutilized plant species (NUS) which has a great potential as a neutraceutical with tremendous health benefits. 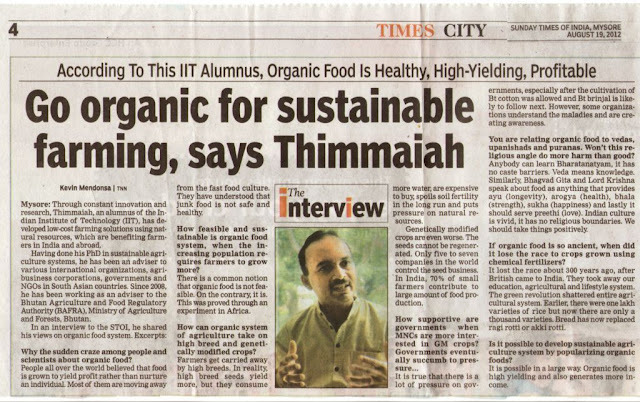 In the present changing climate scenario there is a need to cultivate these NUS to address the food and nutritional security. 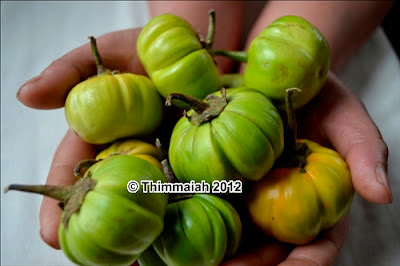 Solanum incanum or Bitter Tomato is one of the common underutilized vegetable found in the markets of Bhutan. Locally it is called as ‘Bi’ sounding more like alphabet ‘B’ in English language. Belonging to family of potatoes, tomatoes and chillies, a native of Northern and north eastern Africa, it is found in Bhutan, Nepal and north eastern states of India. In Bhutan ‘Bi’ is cultivated in elevations ranging from 1000 to 1200 Metres above sea level (msl). However the temperate regions are not suitable for cultivation of this crop. The plant looks more or less similar to Brinjal or egg plant or aubergine (Solanum melongena). 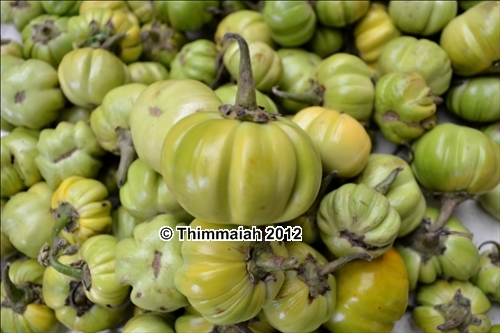 However the fruits do not resemble brinjal, they are more spherical in shape and green to pale yellow in colour. The fruits can grow upto a size of 6 centimetre in diameter. Unlike brinjal, ‘Bi” tastes slightly bitter. The cross section of the fruits looks a lot like tomato which probably may be the reason to call this vegetable as ‘bitter tomato’. The seeds are similar to the tomato seeds and for an amateur it would be very difficult to distinguish them. Cropping of bitter tomato is similar to brinjal beginning with early monsoons. The seeds are sown like brinjal in a nursery during the month of May and transplanted to the main field in June. The land is prepared in a traditional way by ploughing with bullocks. The local breeds of cattle like ‘Nublong’ are versatile draft animals in farming because the tractors and agricultural machineries cannot reach most of the remote villages. Farmers still adopt the time tested good agronomic practices of applying farm yard manure and well decomposed forest leaf litter to maintain the humus of soil. Much of farming in Bhutan is organic by default; hence the soil is rich in organic matter. In the main field the young ‘Bi’ seedlings are planted at a spacing of 45-60 centimetres. Since the cropping season coincides with the rainy season there is no special effort put forward by the farmers to irrigate the crop. During monsoons weeds grow very fast which starts competing with the main crop. Farmers resort to hand weeding at least 2-3 times during the cropping season. The uprooted weeds are either mulched or fed to the cattle as fodder which is a traditional ingenuity of utilizing a waste as a resource. The crop starts bearing fruits from late July and continues till early December. Unlike other nutrient guzzling vegetables “Bi” is a trouble-free crop to cultivate as it does not require much care. The initial application of farm yard manure (FYM) and leaf litter during the land preparation takes care of the crop nutrient requirements. Moreover bitter tomato is resistant to the pests and diseases. 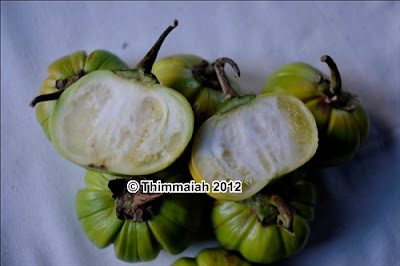 The bitterness in the fruit probably may be hindering the pests to feed on the crop which is a boon for the farmer. Some innovative farmers intercrop ‘Bi” with brinjal and other crops to repel the pests. Bitter tomato in Bhutan is generally fried in oil with potato and spiced up with chillies, garlic and onion. Some people even cook with other vegetables like potatoes and cauliflower and make into a stew or curry. While boiling ‘Bi’ it exudes thick gelatinous substance which improves the consistency of the broth. Interestingly in the West African region bitter tomato is used as a thickener for the soups and stews instead of adding artificial thickening agents. The traditional knowledge on bitter tomato is not well-known by the natives. Many in Bhutan believe that ‘Bi’ helps in improving the rejuvenation of blood and a popular belief exists that atleast once in a year it needs to be consumed for good health. Also people believe that women after delivering the child needs to be fed with bitter tomato to regain her lost energies and also to purify blood. However, scientific studies reveal that bitter tomato is used for skin problems and is anti-microbial in nature. The curative properties are attributed to the presence of solanine and glycol alkaloids. In the vegetable markets of Thimphu in Bhutan ‘Bi’ is sold at USD 1 -2 per kilogram. 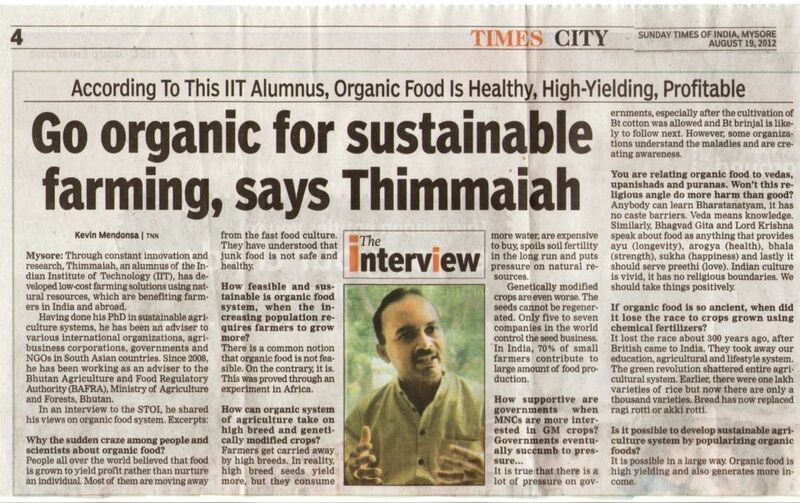 A very profitable crop to the farmers as it requires less effort and resources. To a large extent Bhutanese relish vegetables that are slightly bitter in taste. Since the cultivation of bitter tomato is restricted to the warmer regions of Bhutan like Tsirang, Punaka, Wangdi, Samtsi, natives of these areas are well acquainted with “Bi” unlike their mountain counterparts who are not familiar as it is not cultivated in the higher altitudes. Cultivation of bitter tomato and other native crops helps to diversify the cropping system which has its direct impact on nutrition and health. In addition, it an important sustainable approach for insitu conservation of neglected crops and rediscovering the traditional wisdom of living in harmony with nature.